FUNDIO has no current links. Am I the clown for you? But I drive a VW van painted with flowers and rainbows. I also live in a warehouse dedicated to clowning. 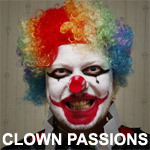 My goal is to be a full time clown and to that end I do nothing but clown related activities. I am the batman of clowns (not the Joker he is a bad guy) and I live in the clown cave. Maybe you are Ms. right. Can you apply whiteface, do a prat fall, spritz me in the face with a soda bottle, and deal with all the clown haters out there? Maybe we should meet for coffee and pie - in the face.